We have been recognised by several reputable organisations for our quality and service excellence since 1995. The awards including Performance Awards presented by Benq (Acer). Benq regards the usefulness of LEOCO products in Electronics Data Exchange. About UL and Leoco Industries Sdn Bhd achievement in UL. 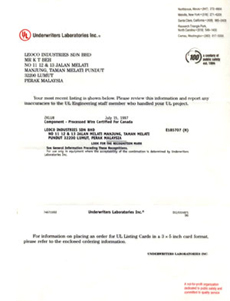 Leoco Industries Sdn. Bhd. has been awarded UL license in year 1997, and this certification has provided the global acceptance of our products. 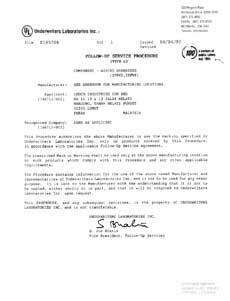 Underwriters Laboratories Inc. which was founded in U.S since 1894 (UL) is an independent, not-for-profit product safety testing and certification organization. It has becoming one of the most recognized, reputable conformity assessment providers in the world. UL provides certification services to assist electrical/electronic control equipment manufacturers in gaining access to the domestic and global markets. Leoco Industries Sdn. 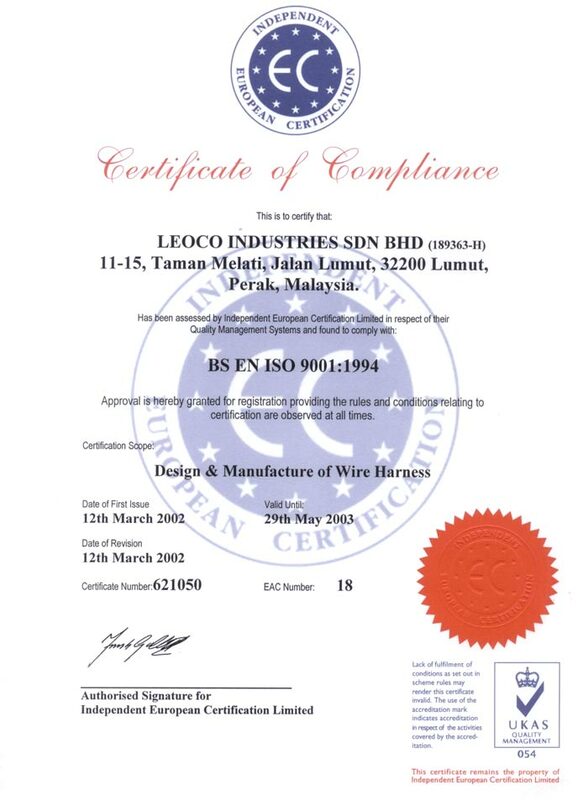 Bhd., one of the leading wire harness manufacturer in Malaysia, has just been awarded ISO 9001:1994 certification in year 2000 and upgraded to ISO 9001:2000 in year 2002 for its main production plant in Perak. ISO 9001:2000 is a quality assurance model for companies involved in business processes ranging from development and production to installation and servicing. It is assessed according to various 'quality management' principles, some of which include customer focus, involvement of people, continual improvement and a factual approach to decision-making. Leoco was awarded with CSA (Canadian Standards Association) in year 1997. Our products have been tested with compliance to national and international standards, and issue certification marks for qualified products. Certification marks tell potential customers and users that a product has been evaluated by a formal process-involving examination, testing and follow-up inspection-and that it complies with applicable standards for safety and performance. 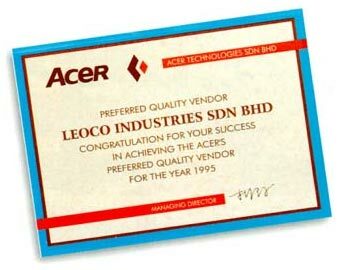 In year 2003, Leoco Industries Sdn Bhd has been awarded by our key business partner SONY with their quality improvement activities, Green partnership. This is the Environmental Quality Assurance System, which assessed by Sony's in-house environmental committees on their business partner. Our products and services rendered to Sony are selected by taking into account the environmental impacts.